KUALA LUMPUR, 18 July, 2012 – Research findings by a team of postgraduate students at The National University of Malaysia (UKM) revealed that Tocotrienal Rich Fraction (TRA) derived from palm oil may have the potential to reverse the aging process. The initial findings made by the students from the Department of Biochemistry at the Medical Faculty discovered that TRA actually has the potential to reverse the shrinking of satellite cells found in skeletal muscles. These are cells in muscles that support the skeleton. 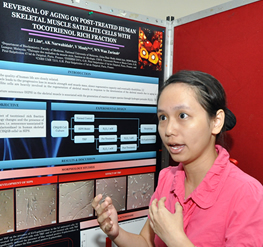 The discovery is one of over 50 such findings exhibited in the ongoing 14th Health and Medical Research Week (RW14) being held at the Faculty of Medicine here from Tuesday 17 July. Lim Jing Jye, who is doing his Masters and involved in the research said that the cells in question have been closely linked to aging since they shrink with age. What the team did was to take human cells from 5 day old infants and exposed them to conditions that simulated the causes of aging. The team found that the cells that have shrunk grew back to almost its original size when treated with TRA. TRA may offer not just a longer life but more importantly a healthier life especially to the aged. She said the focus of the study is not to find the ‘fountain of youth’ but how to make people live longer and at the same time in good health. There were many other equally significant findings made that were exhibited such as anti oxidant and anti-tumour properties found in ginger (Zingiber officinale). There was also research done on ‘belacan’ (shrimp paste) titled “Risk Assesment of local Belacan Intake”. Belacan which is a favourite flavouring ingredient used in many Malaysian dishes is said to contain arsenic and lead which exceeded the limit of Malaysian Food Act 1983 and Food Regulation 1985. However the findings revealed that the daily intake is much lower than the provisional tolerable weekly intakes given by Food and Agricultural Organisation (FAO) and World Health Organisation (WHO) and could not be considered to be harmful to humans. Over 200 participants consisting of postgraduate students and lecturers from the Faculties of Medicine, Dentistry, Health Sciences, Pharmacy and the Medical Molecular Biology Institute (UMBI) are taking part in the programme. It include a series of lectures meant to hone in the skills of the researchers and lecturers in preparing their research proposals and nurturing multidisciplinary collaborations. The RW14 is one of the initiatives by UKM Medical Centre (UKMMC) to equip lecturers and students with the knowledge and skills they need to get their research proposals approved and later recognised at the international level. Dean of the Medical Faculty and Director of UKMMC, Prof Dato’ Dr Raymond Azman Ali, Deputy Deans and heads of department, students, clinicians and lecturers attended the official opening of the RW14.